Adrift pulls you in. It is gripping. Unlike being left adrift, this book reels you in quickly. Adrift delivers part thriller, part character study, and it made my commute infinitely more entertaining. Can I just say that I’ve been reading more and more thrillers recently and I love it? There’s something gripping, obsessive, about reading a thriller. It normally pulls me right out of a slump. Adrift is no different. Each chapter has a different perspective and this allows you to really get in each character’s head. We get to see their motivations, desires, and secrets – but not even totally. There’s always an element of mystery, anticipation, and tension. Adrift begins with a propulsive hook that leaves you stranded, but also intrigued. Immediately we begin to ask questions and this same spirit tethers you to the book. Not only does the thriller aspect drive the momentum of the book, but you begin to examine what happens when ordinary people are confronted with extraordinary circumstances. These conditions make us confront our fears and inner demons, the habits we couldn’t break and the truths we couldn’t speak. There are more pieces moving behind the scenes, conspiracies, attacks, and politics. What catches you the most is the tension, the question of not only what happened but if they’ll make it out alive. Not to mention, you can really relate with them. Throughout the story you find out so much about them, how’d they get there. 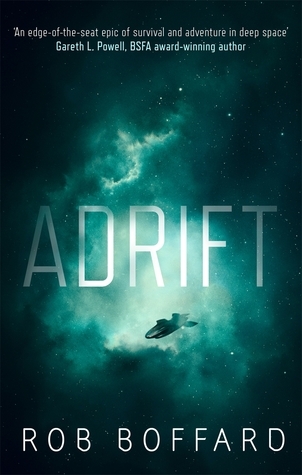 If you like mysteries, conspiracies, and tension, check out Adrift on Goodreads. Do you like conspiracy theories?